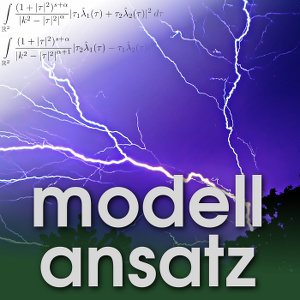 This episode discusses the Born-Infeld model for Electromagnetodynamics. Here, the standard model are the Maxwell equations coupling the interaction of magnetic and electric field with the help of a system of partial differential equations. This is a well-understood classical system. But in this classical model, one serious drawback is that the action of a point charge (which is represented by a Dirac measure on the right-hand side) leads to an infinite energy in the electric field which physically makes no sense. On the other hand, it should be possible to study the electric field of point charges since this is how the electric field is created. One solution for this challenge is to slightly change the point of view in a way similar to special relativity theory of Einstein. There, instead of taking the momentum ( ) as preserved quantity and Lagrange parameter the Lagrangian is changed in a way that the bound for the velocity (in relativity the speed of light) is incorporated in the model. In the electromagnetic model, the Lagrangian would have to restrict the intensity of the fields. This was the idea which Borne and Infeld published already at the beginning of the last century. For the resulting system it is straightforward to calculate the fields for point charges. But unfortunately it is impossible to add the fields for several point charges (no superposition principle) since the resulting theory (and the PDE) are nonlinear. Physically this expresses, that the point charges do not act independently from each other but it accounts for certain interaction between the charges. Probably this interaction is really only important if charges are near enough to each other and locally it should be only influenced by the charge nearest. But it has not been possible to prove that up to now. The electrostatic case is elliptic but has a singularity at each point charge. So no classical regularity results are directly applicable. On the other hand, there is an interesting interplay with geometry since the PDE occurs as the mean curvature equation of hypersurfaces in the Minkowski space in relativity. The evolution problem is completely open. In the static case we have existence and uniqueness without really looking at the PDEs from the way the system is built. The PDE should provide at least qualitative information on the electric field. So if, e.g., there is a positive charge there could be a maximum of the field (for negative charges a minimum - respectively), and we would expect the field to be smooth outside these singular points. So a Lipschitz regular solution would seem probable. But it is open how to prove this mathematically. A special property is that the model has infinitely many inherent scales, namely all even powers of the gradient of the field. So to understand maybe asymptotic limits in theses scales could be a first interesting step. Denis Bonheure got his mathematical education at the Free University of Brussels and is working there as Professor of Mathematics at the moment. M. Kiessling: Electromagnetic Field Theory Without Divergence Problems 1, The Born Legacy, Journal of Statistical Physics, Volume 116, Issue 1, pp 1057-1122, 2004. M. Kiessling: Electromagnetic Field Theory Without Divergence Problems 2, A Least Invasively Quantized Theory, Journal of Statistical Physics, Volume 116, Issue 1, pp 1123-1159, 2004. M. Kiessling: On the motion of point defects in relativistic fields, in Quantum Field Theory and Gravity, Conceptual and Mathematical Advances in the Search for a Unified Framework, Finster e.a. (ed. ), Springer, 2012. Y. Brenier: Some Geometric PDEs Related to Hydrodynamics and Electrodynamics, ICM Vol. III pp 761--772, 2002.